He enlisted as Private, Company E, 29th Massachusetts 6 May 1861 at Plymouth. He was wounded in the head by a fragment of shell at White Oak Swamp (30 Jan 1862). "September 16, 1862 found our division [Richardson's] in the advance from South Mountain to Antietam, where we came upon the enemy. The shot from the first piece of artillery fired took off the leg of the color-bearer of my regiment. During the afternoon of that day the artillery fight was at times very lively. Early the next morning troops were sent to engage the enemy in our front. The roar of the cannons and small arms was deafening. But, while from where we lay we could only hear the cannonading, we could not see the enemy, as a growth of woods impaired ouir view. It was, perhaps, as well, that we could not see the carnage wrought." "Soon an aide-de-camp, whose horse was white with foam, rode up to our position and ordered us to cross to the support of the troops so hotly engaged. We left hurredly, made a detour to the right and left, and were soon fording Antietam Creek. The stream was so deep, that in crossing, we only had to remove the stoppers of our canteens and they would fill themselves. We held rifles and ammunition above our heads. The opposite bank was reached, we removed our shoes, wrung out our stockings, then were ordered forward, straight toward the 'Sunken Road'. Going up the hill we could see the cause of our sudden call. The hill was strewn with dead and dying; yes, and with those unhurt, for to stand was to be instantly killed by the sharpshoters who filled the 'Sunken Road'. The main army in line was only a few feet to the rear of them." He was soon wounded again, in the left knee, while helping to remove a fence in the unit's line of attack, but refused to go to the rear as his officers recommended, but stayed with the Regiment and was treated there by the regimental Surgeon. He was later awarded the Medal of Honor for his actions on 17 September in removing the fence in front of his regiment while under fire. In June 1863 he came down with Typhus and was hospitalized in Tennessee. While returning from hospital in October that year, he was "run down" by a 6-mule team Army wagon, crushing his foot and injuring him "internally". He was back with his regiment in time to be wounded (gunshot to the left arm) again at Cold Harbor (2 June 1864). At the Crater, Petersburg (30 July 1864), we was hit by a "rifle ball, which destroyed his right eye, the ball passing to the back of his head, was left for dead, and was so reported". He was taken from the field, and recovered at home for 18 months. Aside from his many wounds, he was twice promoted for "gallantry in action", having served with his regiment on the Peninsula, Maryland, Vicksburg, Knoxville, Overland, and Petersburg campaigns. 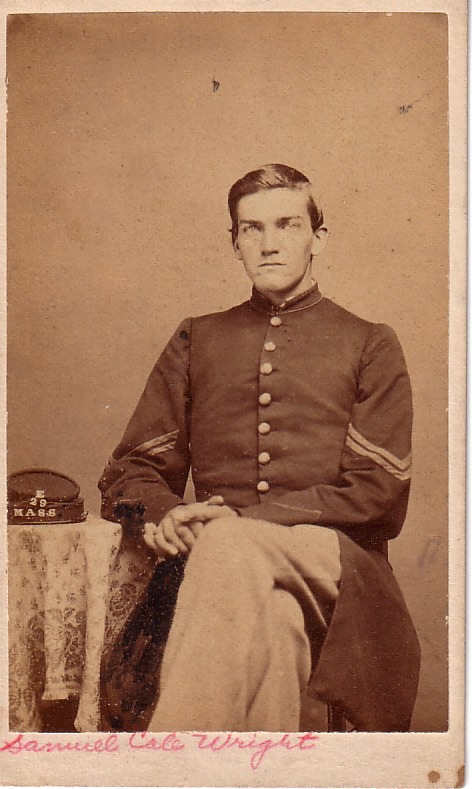 He was discharged from the Army on 3 February 1865 as Sergeant. He was was a Justice of the Peace, worked as an auctioneer, and ran a store in Plympton, MA. Family history has it that when the Democrats were in office he was a storekeeper, but he worked in the U.S. Customs office in Boston when the Republicans were in power. He received a pension from the Army for disablities due to his wounds, but these were deemed insufficient, and addressed by special legislation in 1884. Beyer, Walter F. and Oscar F. Keydel (compilers), How America's Heroes Won the Medal of Honor, Detroit: The Perrien-Keydel Co., 1901; Vol. I, pg. 79. Notes: The portrait above is from a larger picture, also provided by Mr MacLeod. Wright was a direct descendent of Richard Wright and Hester Cook, Mayflower passengers. There is a building development named for him in Plympton.